Our 6 private event rooms offer exclusive locations for an array of business meetings and events as well as social dining; accommodating both cocktail style receptions, executive board meetings, presentations as well as seated lunches and dinners. Each is fully equipped with all the latest technology and can host events from 2 up to 500 people. We have a range of menus to choose from and, of course, our sommelier and beverage teams are on hand to customize beverage pairings to suit your celebration or event. The sugi room seats up to 20 guests comfortably at one table, up to 22 guests max, and can accommodate up to 25 guests at an L-shape table or up to 40 guests for a standing reception. A mobile bar set up is available in the space for events as well. This room has two windows, one over 39th street and another over Madison Avenue, black out shades and scrims for presentations, Italian leather couches for additional seating, and audio visual capabilities such as screen, projector, cable tv, airplay, complimentary wi-fi and audio cords to connect your own iphone or ipod for music. 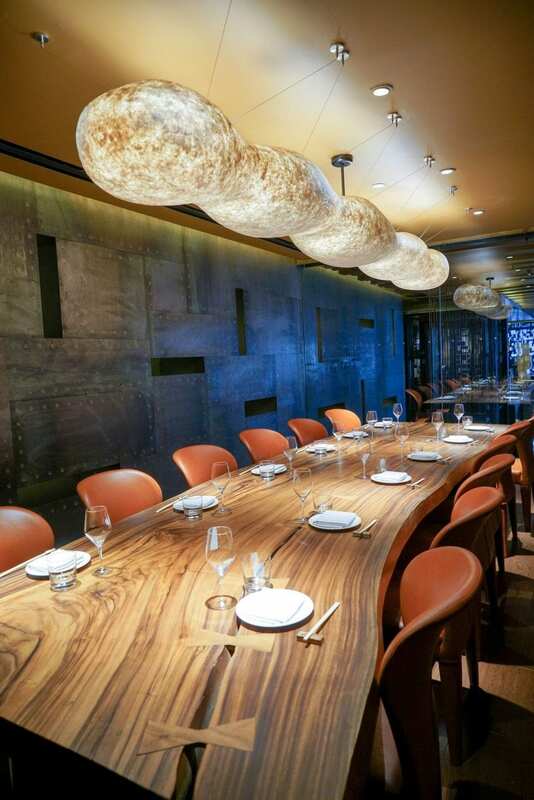 The hana room seats up to 20 guests comfortably at one table and up to 22 guests max at the one table. It can also accommodate two long tables for up to 32 guests max as well as a standing reception for up to 30 guests. A mobile bar set up is available in the space for events. This room has a window over Madison Avenue, black out shades and scrims for presentations, Italian leather couches for additional seating, and audio visual capabilities such as screen, projector, cable tv, airplay, complimentary wi-fi and audio cords to connect your own iphone or ipod for music. The kashi room seats up to 20 guests comfortably at one table and up to 22 guests max at the one table. It can also accommodate two long tables for up to 32 guests max as well as a standing reception for up to 30 guests. A mobile bar set up is available if needed. This room has a window over Madison Avenue, black out shades and scrims for presentations, Italian leather couches for additional seating, and audio visual capabilities such as screen, projector, cable tv, airplay, complimentary wi-fi and audio cords to connect your own iphone or ipod for music. The yuri room seats up to 20 guests comfortably at one table and up to 22 guests max at the one table. It can also accommodate two long tables for up to 32 guests max as well as a standing reception for up to 30 guests. A mobile bar set up is available in the space for events as well. This room has a window over Madison Avenue, black out shades and scrims for presentations, Italian leather couches for additional seating, and audio visual capabilities such as screen, projector, cable tv, airplay, complimentary wi-fi and audio cords to connect your iphone or ipod for music. The matsu room seats up to 35 guests at one table and can accommodate up to 60 guests for a standing reception in the room with its beautiful monkey pod wood built in bar that can be used for cocktails or a sushi station with chef in the room. This room also features a floor to ceiling glass wall that overlooks the main dining area, windows over Madison Avenue, black out shades and scrims for presentations, Italian leather couches for additional seating, and audio visual capabilities such as screen, projector, cable tv, airplay, complimentary wi-fi and audio cords to connect your own iphone or ipod for music. The ume room can seat up to 12 guests with executive arm chairs or up to 18 guests with regular chairs at its one of a kind custom one piece table made of monkey pod wood from Thailand. This private dining room features a floor to ceiling glass wall that looks out over the energy of main dining room. It also includes a small leather couch with a seating area and low table.